I will be housebound. Again. Declan will be housebound for the most part. Again. Trapped in an old house with plaster falling off the walls and cold that is barely shifted by constantly running radiators, while surrounded by stacks of boxes waiting for the move. Today was spent addressing the question of where will he go upon discharge. Our current rental house is not suitable or safe, just once reason is that I can’t use a hoist. He could stay in hospital, but with such a compromised immune system it’s a dangerous game of Russian roulette with his health each day he remains there. 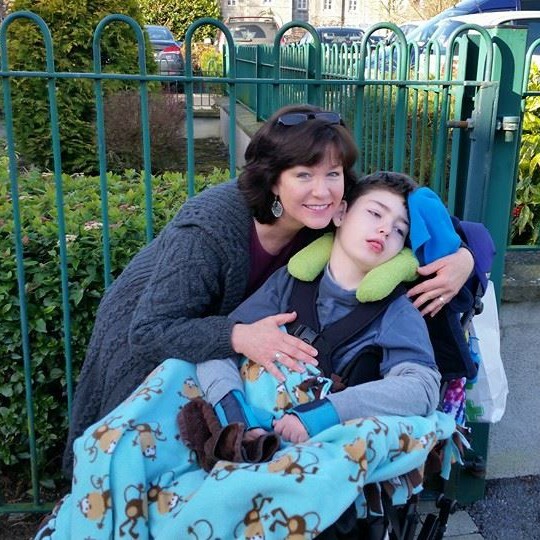 Going to a respite care centre, we thought, would be what would happen, but they are apparently unable to take him. So, rather than leave him in hospital to risk further infection, it was decided that I’ll be bringing him back here when he is discharged on Saturday. I’ve asked someone to come help me lift him – ever so carefully – from his wheelchair to his bed when we get home. Once that is done, Brendan will stay there, in his bed, until we can finally move into his bungalow. I spent a good hour sobbing in his hospital room this morning. I stood at his bedside, held his hand, and cried. I’m afraid of his sore getting worse. I’m afraid of him being back in the house that is so unsafe for his complex medical needs and condition. I’m worried that this third attempt at buying a bungalow for him will once again fall through. I’m devastated at the news received today that the purchase is on the condition that we not set the closing in December. As I stood crying at his bedside, I was again reminded at the isolation and desperate solitude that comes with being a lone parent carer on this journey. No one who saw my tears asked if I was ok. There is no holistic approach anymore, it would seem, when caring for the needs of a disabled child. There should be. Oh, how there should be, for the parent is the lifeline of that child. The system, and often those working in it, frequently forget or ignore that important fact. Anyway, isolation and desperate solitude is what it will be throughout Christmas. We won’t be able to go anywhere – not that any invites would be extended, anyway. Those stopped long ago. Another common side effect to this life families like mine lead. We also won’t have anyone call over – people just don’t come around anymore. I suppose that’s ok, as I don’t have any room at this point for them to even sit down. Christmas has been my favourite time of year since I was a little girl. I still love the season. This year, though, since we won’t be able to be in Brendan’s Bungalow as hoped, and with his continued fragility of health, I’ll be looking forward to January before I even have the Christmas tree put up. This is a first for me. And I hope it’s the last time I feel this way about Christmas. PS: I’ll aim to write a cheerier piece next time. For now, I’ll end it with a photo of a very smiley Brendan taken this morning. Your whole family has been through so much & ye all truly deserve much much better!Words fail me and I feel so angry,I can’t describe how I feel about the way carers and disabled children are treated in this country, where are the ADEQUATE BASIC supports your family needs,BASIC needs like SUITABLE housing for especially Brendan,BASIC requirements such as hoist,etc, ADEQUATE BASIC respite care,etc. Brendan and Declan are both beautiful children and their strong bond is heartwarming to see. I hesitate to say “Best Wishes for the Future” considering the trial & tribulations of your family this year but I sincerely hope the coming year is the Best. It’s dreadful that no one even stopped to ask what was wrong. Especially at this time of year, we should all be aware of the needs of others, even if we could only give a hug. Sending you a virtual one.